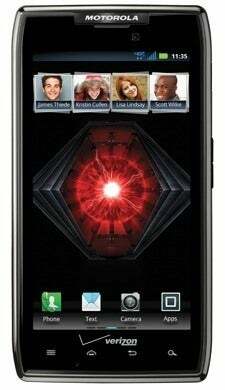 Mobile phone maker Motorola's update of the Droid RAZR to the Android 4.0 operating system appears to be on the way. New official videos posted on the company's Japanese website show the OS running on the handset. Spotted by Droid Life, several videos -- some in Japanese --show off new features in Motorola's custom version of Ice Cream Sandwich. For instance, shortcuts for text messaging and the phone dialer have been added to the lock screen, so instead of unlocking the phone and then looking around for one of those functions, they're right there; on stock ICS only the camera and unlock are available in this way. You'll also appreciate the way ICS lets you access your music controls directly from the lock screen when music is playing. And if you've ever wanted to capture what you're looking at on your phone's screen, ICS makes it simple. Taking a screen shot is only a matter of pressing the down volume and power buttons simultaneously for a few seconds. The phone shows you a quick version of the image it snapped, then saves it to your gallery where you can store it or share with others. The video lineup also includes one that shows off how Webtop 3.0 works. It's an application that allows you to hook the phone up to an HDTV or monitor with an HDMI cable. Once the phone detects it's connected to an external display it launches the Webtop app which lets you see all your apps on the bigger screen and access a full version of the Firefox browser. Webtop came onto the scene back at last year's Consumer Electronics Show when Motorola announced the Atrix smartphone and the "Lapdock" that made it act like a laptop computer. This was huge news because Motorola had somehow beat Microsoft and Apple in creating a converged smartphone-PC device. As CNET's Jason Hiner aptly points out, now that Google owns Motorola the two companies are in a great spot. "The success of Android has established Google as a key player in mobile computing devices, and once consumers and business users start looking to consolidate their many devices, Webtop could make Google the company that's best positioned to make that consolidation possible," he writes. For the record, Motorola has said it will roll out ICS to Droid RAZR users in the second quarter, so that means anytime now. Although it's in Japanese, if you can't wait to see how Android 4.0 looks on your RAZR, here's video that will give you a glimpse.